Booklet gathering market out walks in each district is sold in tourist offices of the region of Gien. Mountain bike and walking excurtions organised by each district are free leaflet available of the tourist office. This site covers 70 hectares and presents all the different natural settings of the Val de Loire: alluvial forest (from willows to oak groves), unspoilt wooded grassland, humid habitats (streams, marshland, water basins). To discover this site follow the path of Gaston; a brochure indicating the exact route is available at the Tourist Office in Châtillon-sur-Loire. 3 marked paths: PR de Saint-Hubert 7km, PR du sentier de Gaston 11km and PR de l’Obélisque 25km. These paths may also be followed on mountain bikes or horseback. This site shall designate the land included between the Loire and the Cheuille in the bed major of the Loire. They shelter the vast natural grasslands a mosaic of habitats typically from since the strikes sandy up to the alluvial forest. 270 plant species, including 4 of patrimonial interest have been identified. The inventory of the fauna, which remains to deepen, reported the presence of 23 species of birds, 16 of species of grasshoppers, locusts and crickets, of a species of amphibien. 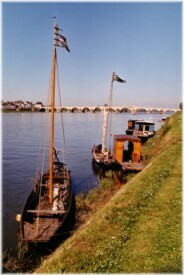 To discover this site, a brochure indicating the exact route is available at the Tourist Office in Bonny-sur-Loire. 2 marked paths: PR Les prés aux moines 10 km, PR du Climat des loups 15 km. 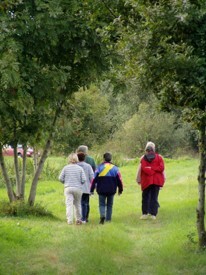 Park country of Trousse-Bois: 2 discovering paths and 1 health patch. Park country of Trousse-Bois belongs to the departmental council which has set up in 1998 and opened to the public. New works have been made to improve the reception of visitors and encourage the discovery of this remarkable space of 57 hectares. Educational signs line the park’s trails and learn about its flora particularly rich and varied. A sports course of 1300 meters offers eleven years, embellished advice to maintain or improve fitness. 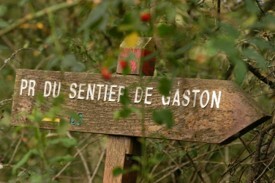 Finally the path of Kit-Wood has 16 km walk, about 4 hours walk from the Loire, the regional park, the canal and the town Briare. Crédit Photo : G PASDELOUP. Toue with cabin (a flat-bottom boat with shelter for the fishermen who fished migratory species near the dams).